CircleUp25 Alumni: Where Are They Now? CircleUp25 is now in its fifth year—with winners to be announced on August 2nd. Over this time, we’ve evolved the program, added judges, adjusted the qualifications and nominations process and incorporated Helio, our internal data science platform for predicting the future business success of CPG brands. One thing that’s remained constant is, of course, our focus on finding and celebrating the most innovative, privately-held consumer brands across CPG and retail. The past five years have been some of the most exciting in CPG. Big brands are struggling to maintain relevancy, upstart brands are gaining market share, and the M&A market is booming with deals. So too have some CPG innovators faced challenges with scaling up too fast. Let’s take a look at past CircleUp25 winners to see how some of the most innovative recent consumer brands are doing today. M&A is so prevalent in consumer because many larger companies are snapping up smaller ones to compensate for eroding market share. 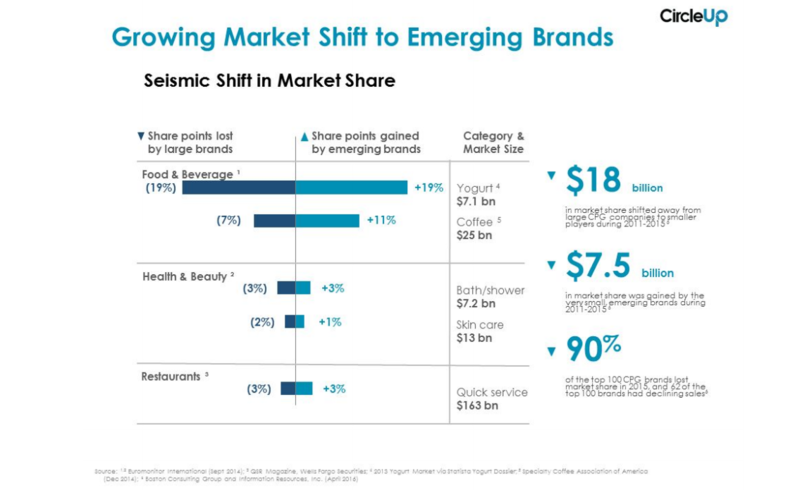 Of 100 top CPG brands, 90% are losing market share and 62% are declining in revenue as modern consumers seek out healthier and more authentic feeling snacks, cleaning solutions, baby foods, and so on. Big CPG brands also aren’t significantly investing in R&D–products like Pepsi, Kit Kat and Clorox have remained unchanged for almost a century. Faced with sluggish sales and with no R&D pipeline to create growth, CPG behemoths are buying the innovation they’ve failed to produce. Several CircleUp25 alumni have seen out-of-the-park M&A exits. The question from here: how well will these big CPG brands preserve the brand authenticity of the innovators, staying out of the way and helping them get ahead? Acquired by Unilever for about $140 million in early 2017. Acquired by Peet’s Coffee for undisclosed amount in 2015. Acquired by Unilever for $1 billion in 2016. Acquired by Pepsi for $1.7 billion in November, 2016. Acquired by Walmart for $310 million in early 2017. Acquired by Pepsi for $200 million in 2016. Acquired by Hormel for $286 million in 2016. Acquired by Estee Lauder for $1.45 billion in 2016. At CircleUp, we think it’s never been a better time to be a startup CPG brand. Marketing costs have dropped thanks to new online channels and social media. Distribution costs have also dropped, thanks to direct-to-consumer sales and small business friendly retailers like Amazon and Whole Foods. And there’s now widespread demand for higher quality, authentic products, which emerging brands serve up—and big brands historically do not. Dozens of past CircleUp25 winners have grown what started as seemingly niche cult followings into widespread appeal, earning themselves a certain startup darling status within the CPG limelight. Curious who the next M&A exit targets are? These are probably a good place to start. After doing $50 million in revenue in 2015, Everlane estimated they’d hit $100 million at the end of 2016. One of its newest products, “The Day Heel,” sold out in a matter of days and racked up a 28,000 person waitlist. Founder Tim Brown told CNBC that when Allbirds initially pitched investors, they laughed at his projected sales numbers but somehow invested anyways. Ten months later, Allbirds surpassed those anticipated sales figures four times over. Casper had sales of $1M in its first month, and since has raised $70 million in venture capital, grown to $100M in cumulative sales. After reportedly tripling its revenue from 2015 to 2016, Peloton grew to about 400 employees and is doing $200 million, as of earlier this year. Sweetgreen is expected to near 100 storefronts by the end of this year, but the brand is much bigger than its retail locations. It’s pushing the envelope by going fully cashless and putting on music festivals. Warby Parker is reportedly on track to do $250 million in revenue this year—all while selling a supposedly niche item (eyeglasses) that people were thought to only buy once every few years or more. A handful of CircleUp25 winners have gone on to see impressive growth and make undeniable impact on their categories, but their success has not come without hardships. All companies experience bumps in the road—and CircleUp25 alumni are no exception. For innovative, early-stage CPG brands, growing pains often strike when companies bite off more than they can chew—often in the form of taking on a high valuation when raising large amounts of capital. This is especially common when CPG brands raise funding from traditional tech investors, who don’t necessarily understand underlying industry fundamentals and project unrealistic growth goals onto a company. While a few CircleUp25 alumni have hit harder times over the last year, they’ve undoubtedly still changed CPG for the better by paving new ways and ushering in more innovation to the industry overall. Last year, Honest Company was reportedly up for sale. The issue: it’s now raised $200 million, putting it at a valuation north of $1 billion—a very steep price tag. Unilever, its speculated buyer, ended up purchasing classic CPG brand Seventh Generation for $700 million. Earlier this year, Blue Apron found itself at a triumph moment—a highly anticipated IPO. For those that sold shares that day, this company is likely considered a great success. Yet, with Amazon acquiring Whole Foods just a few days before the public market debut, Blue Apron dropped its IPO price by $5, and it’s continued to drop after listing. Hampton Creek has always described itself as a tech company that happens to make CPG products. With this tech lens, it’s raised at least $200 million at a valuation of over $1 billion. This pressure may have contributed to its reportedly aggressive growth hacking tactics, which have recently attracted controversy in the press. Like many early-stage CPG brands, several other CircleUp25 winners not mentioned here fall into these categories, and several are still chugging along at a strong rate, but still have a lot to prove. Curious who will win CircleUp25 this year? We’re announcing the new batch of twenty-five winners on August 2nd in Forbes. Previous: Previous post: When Will the Robots Take Over Venture Capital?